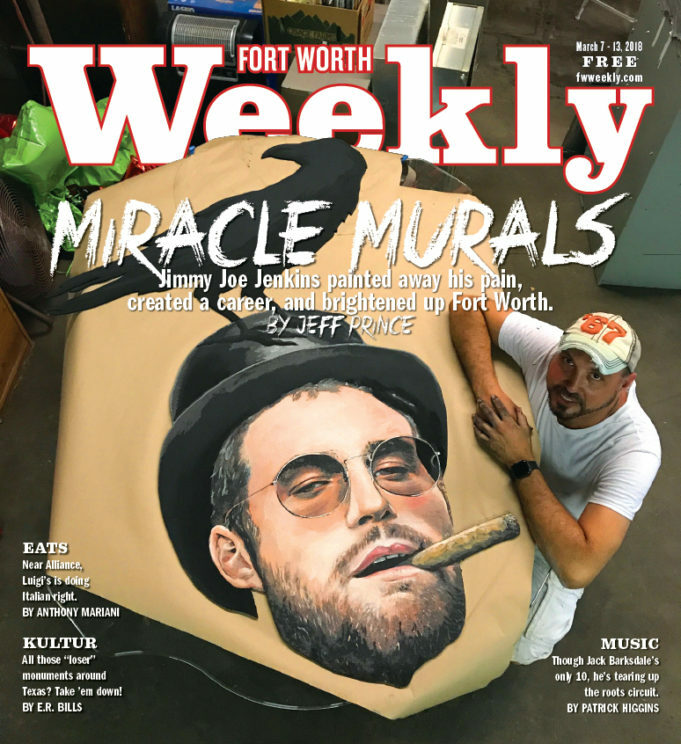 Jimmy Joe Jenkins painted away his pain, created a career, and brightened up Fort Worth. Courtesy of Jimmy Joe Jenkins. “Monkey Lisa” is the first mural ever done by Jimmy Joe Jenkins, and it was a major success, pleasing the building’s owner, his customers, and the neighborhood. The untitled creation is typically referred to as “The Monkeys” and was completed on Thanksgiving Day in 2016 on the east wall of Lettuce Cook, 5101 White Settlement Rd. The image served as the perfect calling card for Jenkins as he continued to solicit property owners for access to their bare walls. 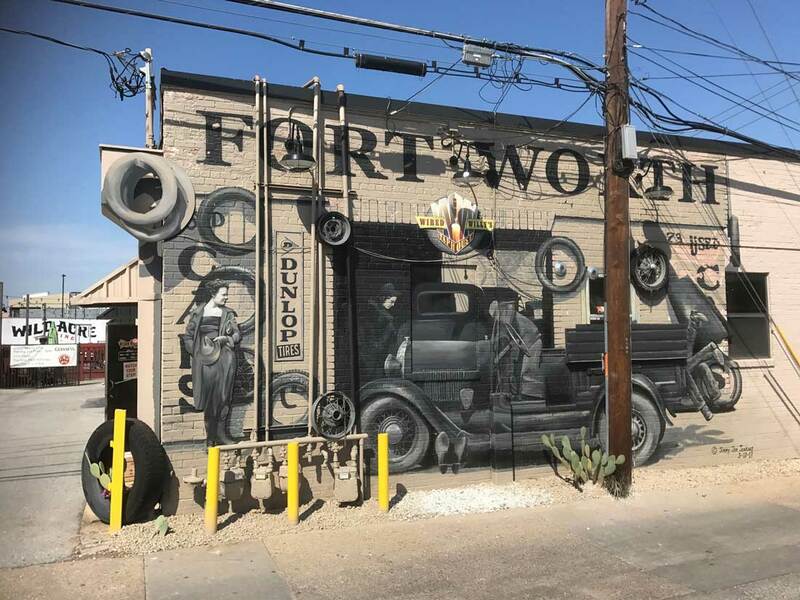 Outdoor murals are becoming the rage in Fort Worth. The Stockyards and Sundance Square have long used large paintings on outdoor walls to attract attention. 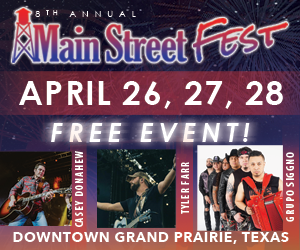 Other parts of town, such as the West 7th Street party area, are getting the fever. One of the most prolific muralists in recent memory is a guy fairly new to the endeavor. 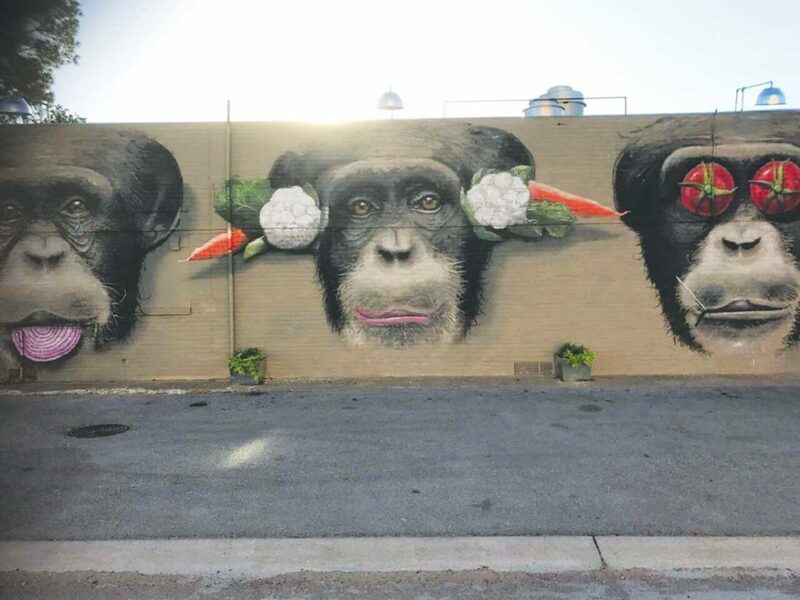 Jimmy Joe Jenkins’ first mural – three monkeys painted on the side of Lettuce Cook at 5101 White Settlement Road –– was completed a year ago. 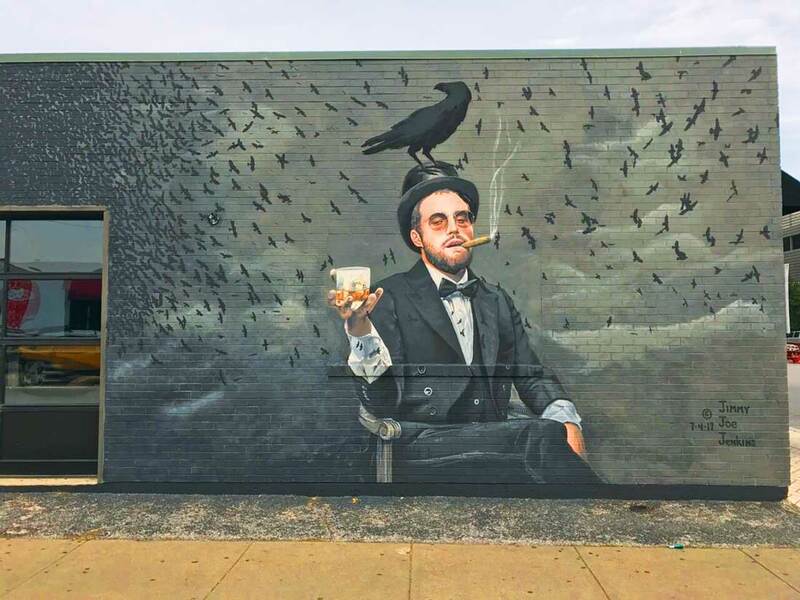 Since then, he has painted a half-dozen other walls from West 7th to the Cultural District and farther west in the burgeoning River District. His fast pace means Jenkins should have a dozen murals scattered around town by this time next year. All will be interconnected thematically in way that will become more evident once they are finished, he said. Jenkins plans to write a book to describe his artistic visions and their messages. Well, he’ll paint more. He wants to start a new series of murals with a Western bent that will also be interconnected with thematic symbols, clues, and messages. To find his “canvases,” Jenkins goes on reconnaissance missions, driving around neighborhoods, searching for buildings with large outdoor walls facing high-traffic areas. He approaches the owners and offers to paint eye-catching murals that can transform their properties into landmarks. For a price. So far, he hasn’t had much difficulty finding customers. “I was the first,” said Todd C. Brown, chef and owner of Lettuce Cook. Brown opened his restaurant a couple of years ago and noticed the large brick wall on the east side of his building. He decided a mural would give his place some pop, and he began interviewing potential muralists. Jenkins lives nearby. “He came up to me and said he wanted to throw his name in the hat,” Brown said. Jenkins drew several mock-ups but nothing that blew away Brown. “Then he came one day with the monkeys, and they were just fabulous,” Brown said. Jenkins’ original concept leaned toward the more traditional see-no-evil monkeys. Brown wanted food incorporated into the artwork. Jenkins added fruits and vegetables to the model, and Brown was sold. Weeks passed. The wall remained blank. “It took us a while to get started,” Brown recalled with a laugh. During the initial delay, Jenkins admitted he had never done a mural before. This is one of two pinup models that Jenkins completed on May 14, 2017 — Mother’s Day. He refers to them as the “Mother’s Day Pinups.” He painted them at the Velvet Box, an adult toy, lingerie, and gifts store at 2917 Morton St.
Jenkins had been teaching himself to map out his mural to transfer the design to the wall. It was difficult creating the template on his cramped garage floor and hard on his back from squatting down and leaning over so much. He leased an abandoned automotive shop on White Settlement Road and turned it into an art studio to give him more room. “After that, it just took off,” Brown said. The monkey mural has given Brown’s property personality and brand recognition. With his first mural finished, Jenkins went right to work on the next. And the next. 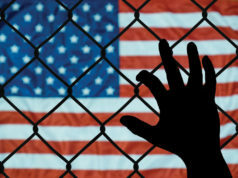 The images are striking and beautiful. They combine realism with mystery, vivid colors, and often whimsy. Few people, however, knew of the anguish that was driving Jenkins to paint. 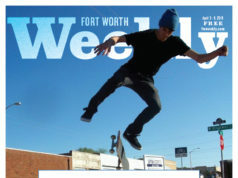 Jenkins had co-owned Fort Worth Screen-Printing for 20 years, creating marketing materials for corporate clients. He oversaw 45 employees and watched the business thrive but eventually began feeling like a number-crunching businessman rather than a creative artist. About eight years ago, Jenkins was riding his bicycle late at night near 5th and Throckmorton streets downtown. The next thing he knew, he was lying on the ground and staring up at police officers. An unknown person had attacked him. Jenkins never saw the person, and police never found him. They speculated that someone attacked a stranger as part of a gang initiation. He endured two surgeries. Five metal plates in his face. Wiring in his jaws. Loose teeth. Physical pain. And there was psychic damage. Jenkins suffered anxiety, a feeling he described as post-traumatic stress disorder or PTSD. He began thinking that his remaining days on earth were too precious to work at a job he didn’t love anymore. 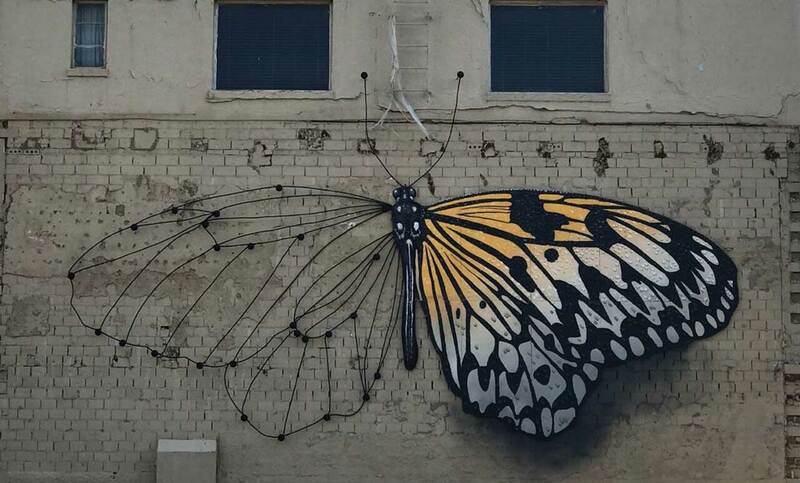 “Making Change” depicts a 36-foot-long Monarch butterfly and represents the cycle of life, Jenkins said. Completed on Sept. 22, 2017, the creation adorns the north wall at Pearl Snap Kolaches, 4006 White Settlement Rd. It’s made from wires and juts out from the building, giving it a slight 3-D look. It also serves as a celestial clock whose wires create shadows. “When the sun shines through these spokes and these wires, it will create art,” he said. He began renovating homes in his neighborhood while considering his next move. Before long, he decided that exploring his artistic side was his true calling. His murals serve as stand-alone works of art, but Jenkins is creating something far bigger than individual pieces. Jenkins isn’t saying what. His upcoming book will explain their significance, he said. The attack on Jenkins – who is friendly, soft-spoken, and gentle by nature – didn’t just lead to the murals. 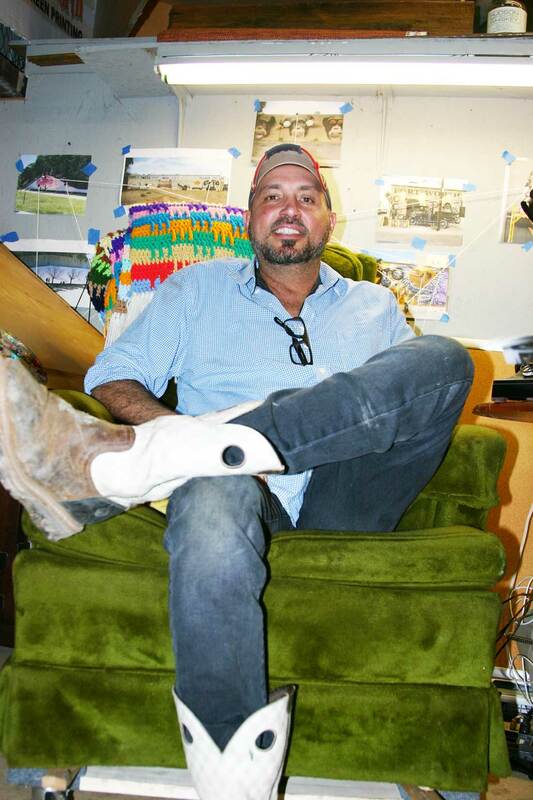 It prompted the artist to transform his studio on White Settlement Road into the nonprofit Everybody’s Place. 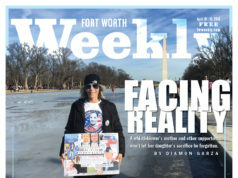 Jenkins teaches others to use art and various activities as a means of dealing with personal tragedies. Art therapy, Jenkins calls it. Some paint pictures. Others sculpt. Still others cook or weld or work with wood. Some get their hands dirty in a community garden out back. Others perform yoga or dance. Old people pass along their knowledge to the young and vice versa. On a recent afternoon, a woman named Nora was dipping a brush into paint and creating a row of red bricks on her canvas. One brick she left blank. Nora planned to fill that empty brick space by writing down in black ink the names of people from her past who had caused her pain and suffering. After she wrote down all the names, she planned to then cover them up by painting a brick over them, thereby putting her trauma behind her. Jenkins, too, has improved his mindset through art therapy, so much so that he didn’t want this story to make a big deal about his being attacked and almost killed. Jenkins: “It was a blessing instead of a tragedy. It taught me what was important.” Photo by Jeff Prince. Awesome article. I lived in a world renowned mural city (San Francisco) for many years and I would stroll areas of the city to take as many photos as I could. It’s a wonderful experience to try and figure out the artists inspiration and to put your own translation into it. I’ve been extremely excited seeing these mural and urban art pop up in and around Fort Worth. They make me smile.